Vinpocetine is a key supplement for anyone looking to improve cognitive function, increase brain power and generally revive their mental agility. Derived from Vincamine -a naturally-occurring substance extracted from the periwinkle plant -Vinpocetine can increase brain flow, which helps anyone suffering from reduced cognitive powers. As we get older the neurons in our brain responsible for helping us think decline. That makes us less able to concentrate and reduces our mental capacity. Vinpocetine can increase brain blood flow, which helps to improve cognitive function and increase brain power. Vinpocetine is a recognised senile dementia treatment. Studies suggest that it can prevent damage to the brain and improve mental performance after a stroke or other serious illness. Taken as a supplement, it can also be used to increase brain powerand delay cognitive decline generally. A member of the ‘smart drug’ family, used to improve memory, motivation, concentration and attention, Vinpocetine increases the uptake of oxygen and glucose to the brain. This makes it useful, not only as a senile dementia treatment, but it can also help with hearing and eyesight. Vinpocetine tinnitustreatment, for example, has been known to substantially subside this hearing condition. Vinpocetine has been widely used for more than 25 years, and has been the subject of many research studies around the world. Scientists do not yet fully understand the way it boosts brain power, but what is known is that it acts as a vasodilator by widening the blood vessels and allowing blood to flow more easily. It does this without any adverse effects to pulse rate, blood pressure or breathing. Researchers also believe that Vinpocetine has anti-coagulant properties, which means it can prevent blood cells from sticking together, thereby reducing an individual’s chances of having a heart attack. Vinpocetine benefits part of the brain stem, the locus coeruleus, which is associated with our physiological responses to panic and stress. The locus coeruleus is also responsible for the neurons in our brain that help us think and plan. As we age, those neurons decline and the ones remaining become less active, which reduces our ability to concentrate and focus mentally. 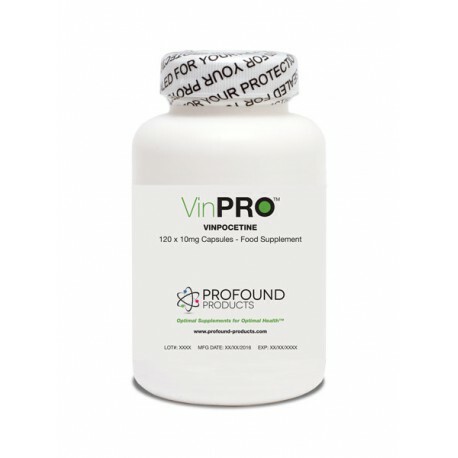 While scientists may not fully understand the way Vinpocetine works, they have managed to indicate its benefits through clinical trials. In one trial, patients who had suffered chronic ischemic stroke were shown to have restored regional cerebral blood flow after a 14-day period. In another study, using Doppler imaging and neuro-psychological testing, people taking Vinpocetine showed marked improvements in blood flow compared to those taking a placebo. In other research, patients with senile dementia who took Vinpocetine showed improvements in attention, concentration and memory compared to those taking a placebo. Vinpocetine is primarily used as a supplement for improving mental faculties. However, its ability to increase blood flow has benefits in other areas too, such as hearing and eyesight. Vinpocetine protects against brain arteriosclerosis, which is a condition where the capillaries and arteries harden and become less flexible. Left unchecked, this can lead to a stroke. Moreover, Vinpocetine only affects the areas of the brain that require treatment. This means it can be used to improve hearing -in particular tinnitus -and eyesight difficulties. Other studies have suggested it may be beneficial in alleviating depression and menopausal symptoms. There is evidence, as well, that Vinpocetine may help ease epileptic seizures. How can Vinpocetine help me? Not so long ago, scientists believed that cognitive decline was an inevitable consequence of growing old. Many of us still do, yet that isn’t the case. The same lifestyle factors that affect our overall health can also help protect our brain. By preventing diabetes, coronary artery disease, cerebrovascular disease and hypertension, it is perfectly possible to enter into our 90s with our cognitive functions intact. At higher dosages, seek your physicians advice if combining with potent vasodilators such as ginkgo biloba, Hydergine, Nicergoline, Picamilone, or Xanthinol Nicotinate. Derived from a naturally occuring substance – the periwinkle plant, vinpocetine is a cerabral metabolic activator, which can increase brain blood flow and improve cognitice function. Directions: For adults only, take 1 capsule 1 to 3 times per day, with meals, or as directed by your physician. Note: Not for use by children or by pregnant or lactating women. do not use this product if you have abnormally low blood pressure, are taking a blood thinner, or have excessively rapid heartbeat (tachycardia). Store in a cool, dark, dry place; this product should be used within 2 years of purchase or 1 year of opening.